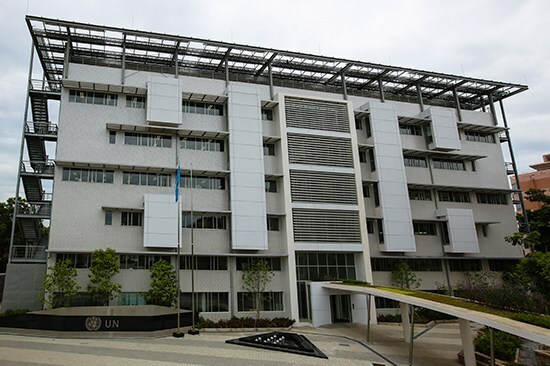 Hanoi (VNA) - The Vietnam Green Building Council (VGBC) on May 22 awarded the Green One United Nations House (GOUNH) in Hanoi a Platinum Lotus certification, the highest level in the market-based green building rating system. The certificate is in recognition of the GOUNH, a high performance green building that enhances the efficient use of resources through smart ecological design and management. The Platinum Lotus certification follows the building’s previous accreditation by the VGBC as one of the first buildings in Vietnam to be awarded a provisional Gold Lotus Rating. The GOUNH project is a joint endeavour between the government of Vietnam, donors and the UN bodies. The Lotus rating system promotes the construction of environmentally sustainable buildings to ultimately bring about the efficient use of all forms of resources. This would help reduce all forms of environmental degradation, and be better for its occupants’ health as well as productivity. A key milestone in the UN reform process in Vietnam and the Delivering as One initiative, the GOUNH is a testament of the UN’s commitment to delivering green. The building has become a role model for sustainable green buildings in Vietnam, signifying the importance and urgency of environmental sustainability. Advocating climate change mitigation and adaptation, the GOUNH building is constructed of ecologically friendly materials such as lead-free paint and has furniture that has low harmful, volatile organic compounds. The efficiency of its heating, cooling and energy systems is maximised through photovoltaic panels harnessing solar energy, which can provide for at least 10 percent of the building’s annual electricity consumption. Kamal Malhotra, UN Vietnam resident coordinator and chair of the GOUNH Management Board, thanked and acknowledged the collated efforts of the Vietnamese government, donors, UN agencies and development partners.